Rafa Nadal speaking at his press conference last night after winning the Wimbledon men’s singles title for a second time. It also sums up 13 long days and nights covering my fifth Championships at the All England Club. 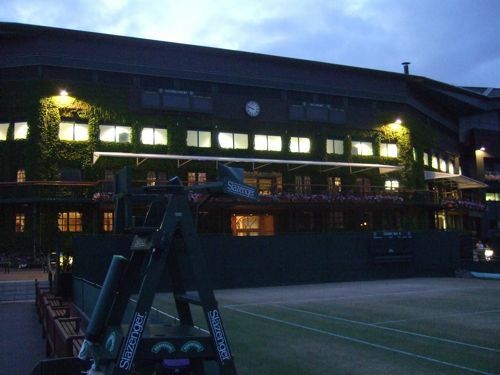 Wimbledon has a magical hold on those from all four corners of the globe who are lucky enough to be based in the Press Centre for the fortnight. An annual love affair with the greatest tennis tournament in the world. Taking in the sights and sounds of Wimbledon from early morning to late night and talking to players after they come off court. The crowds were long gone as I walked around the deserted grounds just before 10pm last night. Just the last few workers heading for the gates, taking one wistful last look behind them as the light faded. The magic packed up and put away for another year, yet still hard to say goodbye. Another summer gone and 50 weeks to wait until the next time we meet upon the lawns of SW19. How crazy is the life? 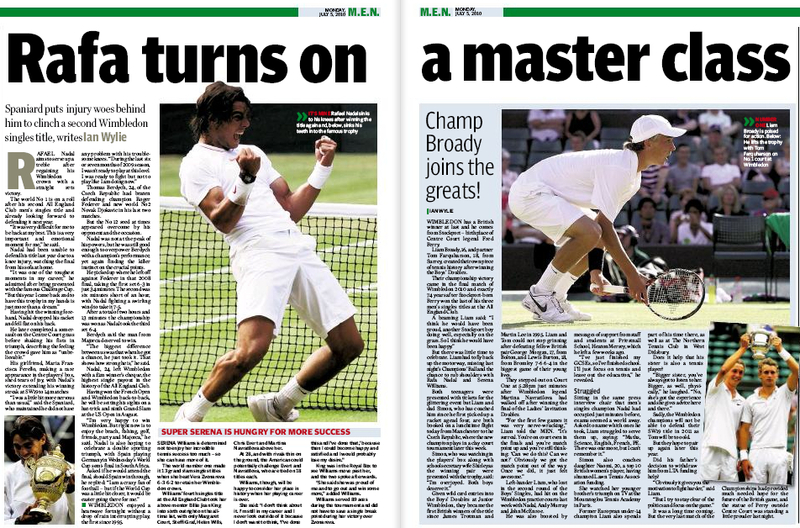 I again covered the Championships for the Manchester Evening News, writing a Wimbledon lead plus Diary each night for the next day’s hard copy editions. The thirteenth day was one of the busiest, covering both the Men’s Final on Centre Court and the Boys’ Doubles Final on No 1 Court, followed by the press conferences. You can watch some of the edited interview room highlights via the Official Wimbledon site Video Gallery. As it turns out, I ask the first question on both “Nadal shows why he’s No 1” and “Broady and Farquharson Interview”. With Serena Williams’ “Sinatra” answer to my question about her little dance in the clubhouse included in the video “Quotes of Wimbledon 2010”. Serve up the links below to see some of the photos I took around the grounds both before, during and after the event. You can listen to the band on A Perfect English Summer’s Day. Plus check back in my Twitter feed for other links etc. The 2011 Championships begin on Monday June 20. Shall we make it a date?